THIS REVIEW OF ‘SYMBIOTE SPIDER-MAN’ #1 CONTAINS MINOR SPOILERS. by Clyde Hall. The Spider-Man suit resulting from Secret Wars had a lot going for it. Anticipation for the new look was fostered in fandom, teased a year in advance through various sneak peeks. The black uniform utilized alien ‘smart tech’. It did away with the “I’m out of web fluid!” trope, allowed Pete to carry stuff around like a Bag of Holding, and it could morph into part of his street clothes. For other superheroes these might have been inconsequential, but for a Spider-Man once forced to don an FF uniform with bag mask, this was quite an upgrade. The timing was spot-on for me as well. I’d entered a professional trade and left teenage troubles behind. Seemed hard-luck Parker had finally risen in status, too. Of course, the Parker Kismet eventually caught up with our hero, and the ‘tech’ was revealed to be a symbiotic life form feeding on its host. A cloth version of the black uniform didn’t retain the cool factor, and along came Venom when the symbiote found a new host in Eddie Brock. Overall, it’s one of my favorite eras of Spider-Man history, villainous outcome included. As dependable as Parker Kismet, Marvel’s Gobs-R-Better Philosophy ensued: If one symbiote character was popular, make lots more! Venom begets Carnage, Scream, Mania, Scorn, Toxin, Anti-Venom, Red Goblin, etc. But before the gaggling of symbiotes began, there remained fond memories of that black-and-white alien suit. 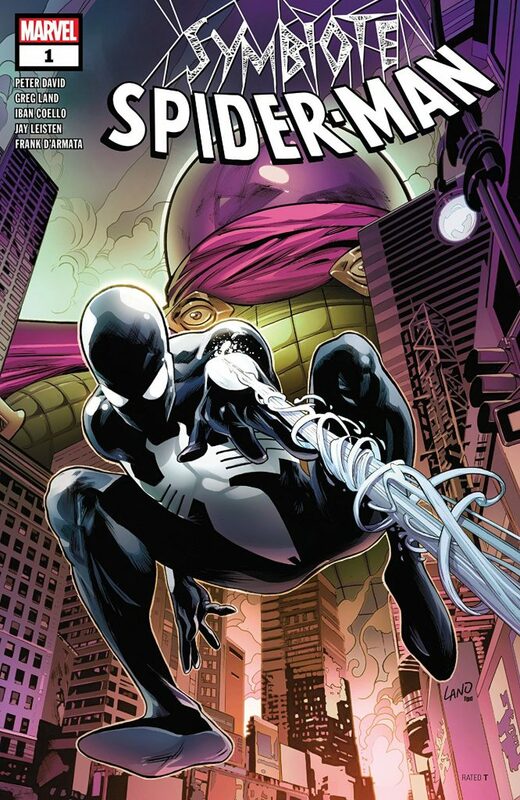 Marvel is banking on its remembered appeal with the retro-set Symbiote Spider-Man #1, out this week. Writer Peter David wastes no time recapturing the best parts from that storyline by utilizing a blend of humor and pathos. It’s a high note in Parker’s costumed career. He’s fresh back from Battleworld after representing Earth’s heroes in the gladiatorial arena of Secret Wars. He’s getting used to this high-tech alien uniform and all its benefits. 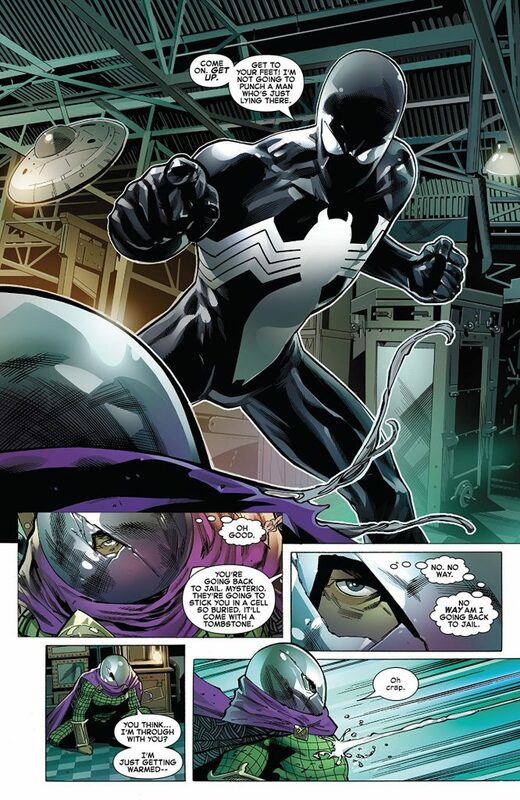 His relationship with Felicia Hardy is broadening past masks-with-benefits as she begins to take an active role in the Peter Parker side of his identity. 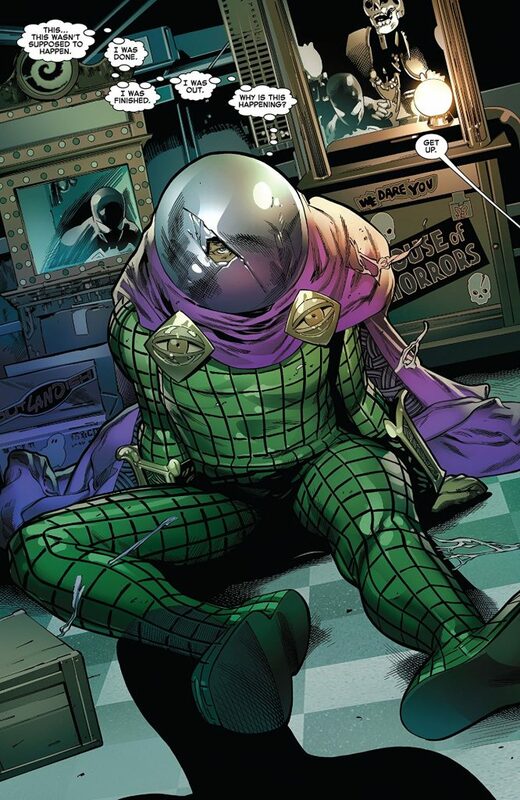 David’s narrative also makes this a turning point in the career of Quentin Beck, the costumed criminal known as Mysterio. Long pursuing a super-villain rep, he’s faced with the prospect that he’s merely an actor using special effects to pass himself off as a malefactor. Worse, a bad actor giving a lackluster performance. He plans a final theft, one with a huge payout before taking his felonious curtain call. Afterward, he’ll simply purchase revenge against Spider-Man, hiring others to plague his former nemesis while Quentin enjoys the good life. But even the best illicit plans go sideways, and Beck’s sub-optimal one isn’t exceptional. An inadvertent encounter in his secret identity soon after leads to unexpected confrontation between Wall-Crawler and SFX Guru. 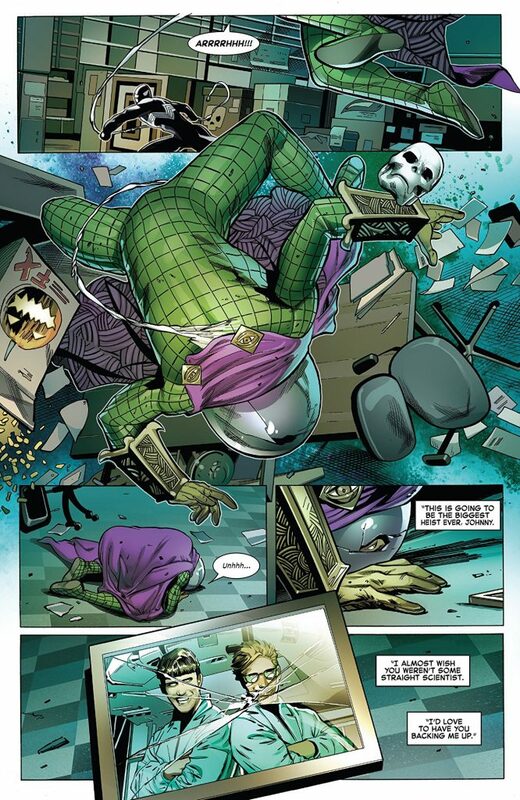 The outcome galvanizes Mysterio, making him a more serious threat to Parker’s continued health and welfare. Between these major story points, Spidey confronts another villain from his past in the gloriously smarmy manner so much fun in its day. Spider-Man doesn’t just best you. He belittles you, insults accentuated by injury and pending incarceration. David excels in resurrecting that trademark Spidey flair and humor. Simultaneously, he layers on serious dramatic impact. How appropriate his mix reads becomes a matter for each fan to decide. The most pointed example is a nostalgic, gag-laced fight amidst a setting that tragically no longer exists. It represents an indelible part of the character’s past, his home town, and the scene is true to the period. And the creative team didn’t include this particular scene without giving it considerable forethought; backup steps were taken in case corporate powers vetoed it. However, it was allowed and it’s a jarring sequence. Greg Land’s pencils with inks by Jay Leisten display appealing affinity for the look of the Spider-books of the time and for the characters’ earlier appearances. Mere panels cannot contain the energy Land brings to this tale, either in reflective sections or full-on super-powered conflicts. Frank D’Armata’s colors are vibrant enough to bring the fun, yet moody enough to slip into near-noir when dealing with narrative themes of personal loss. Joe Sabino includes cinematic sounds to the battle lettering, and given Mysterio’s movie background, it’s legit. Overall, this is a nostalgic, rearview visit to an earlier Spidey and a different period. It comes complete with clever riffs on movies and comics culture, a healthy dose of laughs, and equally sober moments of poignancy. The jury will have to weigh how those last two balance, for good or for ill. But if you liked the alien suit angle originally, first-run or from condensed collections of Spider-Man during those years, chances are you’ll also find Symbiote Spider-Man #1 a rewarding read. Flashback sequences by Iban Coello and Frank D’Armata. Check out this 3-page preview of ‘Symbiote Spider-Man’ #1, courtesy of Marvel!